Benedict XVI: "With the Papa Emeritus I have tried to [be] completely clear that there is only one Pope"
Which one is the real fake? In case you missed our initial announcement on September 26: Our popular TRADCAST podcast program is back with a new, full-length episode! As always, it is loaded with real traditional Catholicism, hard-hitting refutations of various errors, razor-sharp analysis, and a touch of humor. TRADCAST 019 covers a number of different topics, but particular attention is given to an idea that is gaining more and more popularity among Novus Ordos and Semi-Traditionalists as they reach the breaking point over the chaos "Pope" Francis is causing: the idea that Benedict XVI is the real Pope and, in any case, a stalwart defender of orthodoxy and restorer of Tradition. The truth about Joseph Ratzinger, however, is very different. This latest podcast also includes a funny reminder as to why you're not Novus Ordo anymore, and lots more, so be sure to tune in! The total run time of TRADCAST 019 is approximately 1 hr 9 mins. Here’s an idea: Why not host a TRADCAST party at your home and invite family, friends, or neighbors over to discuss the show? You can also listen to older shows using our complete episodes list; or listen to a sermon or an apologetics/catechism class with your friends and family as well. This makes for great conversation -- much more important than football or politics! -- and will open people’s eyes about Francis and the Novus Ordo Sect! It’s one way you can do evangelization the easy way. In any case, don’t miss this TRADCAST and spread the word! You can listen free of charge by playing the YouTube video above, or you can go to our TRADCAST 019 page, where you will find all the information you need for this show, including links to all the articles, books, blog posts, etc., mentioned in the podcast, and where you will also find ways to download this episode to your computer and sign up to be notified of new episodes by email. 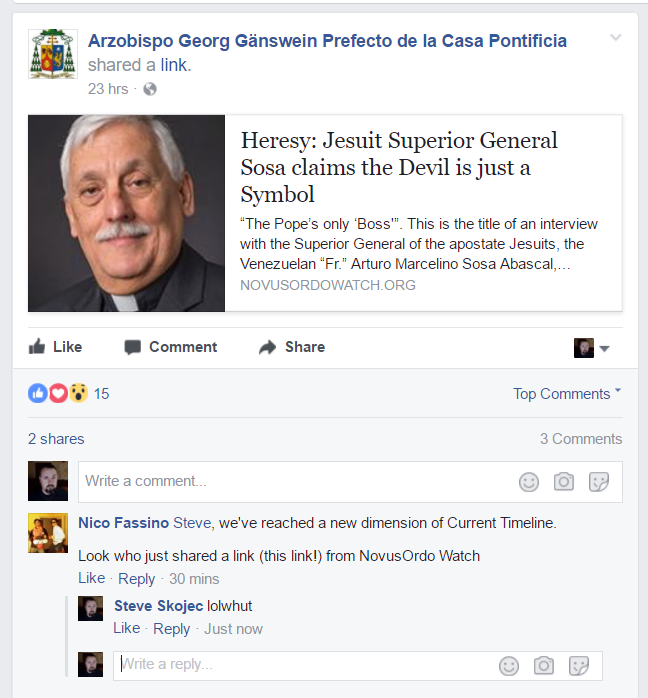 Segment 1: Chaos in the Novus Ordo Church; the "Benedict XVI is the real Pope" deception; disunity in the Novus Ordo Church vs. Sedevacantism; comments on The Remnant's "Catholic Identity Conference 2017" and analysis of "Catholics Rising" promo video; comments on the dubia and formal correction; a look at recent news headlines; why you're not Novus Ordo anymore, reason no. 6042. Segment 2: The 1985 Ratzinger Report and the 2017 Cardinal Muller Report: nothing has changed in 30 years; rational proof for the existence of God; comments on Chris Ferrara's "Francis Expands the Fake Magisterium". It's a clever ruse because... they're both Antipopes! Benedict XVI: Church is "On Verge of Capsizing"
Few people in the world bear more personal responsibility for the theological, moral, liturgical, and pastoral chaos in the Vatican II Sect than Joseph Ratzinger. So, what conclusion do we draw from all this? Novus Ordo Watch is having more and more of an impact. This means that it is getting more and more difficult for the Modernists, even in the highest echelons of Vatican City, to ignore Sedevacantism. Sedevacantism is growing, and this is a problem not only for the Vatican II Sect proper, but also for its various traditionalist offshoots that constitute a false opposition, especially the Society of St. Pius X (there's a reason they published a 700-page book against Sedevacantism last year). Unlike the various indult communities or the SSPX, the Roman Modernists have no power whatsoever over Sedevacantists, nor can they entice us with offers of "full communion" or "regularization". So you can easily see, ladies and gentlemen, that supporting Novus Ordo Watch is a really good idea. Your help, whether financial or otherwise, does bear fruit. Just imagine how much more of an impact we could have in the future if enough people join the cause! And there we go. As Modernist “Pope”, Joseph Ratzinger gets to invent new doctrine as he pleases. Hopefully this latest Novus Ordo hogwash does not need any commentary. Now "Abp." Ganswein Weighs In: Benedict's Emeritus Status "Corresponds to Reality"
Antonio Socci: "Ecco la Risposta Seria di Ratzinger (Tramite Don Georg)"
While we don't pretend to be exegetes of obscure scriptural passages, we'd just like to offer the opinion that perhaps the second beast is the Ratzinger-Bergoglio entity, whereas the "former beast" is John Paul II, Ratzinger's immediate predecessor, whose "wound to death was healed" (remember the assassination attempt in 1981?). With the impending "canonization" of the wicked John Paul II as a supposed "Saint", who was "beatified" by Benedict XVI (May 1, 2011), Bergoglio (Francis) may now be trying to "cause the earth ... to adore the first beast". Just a thought. Be that as it may, it is clear this whole thing is a complete mess. But we are convinced it serves only one purpose: to draw those trying to be good and faithful Catholics in the Novus Ordo Sect into more confusion and give them a new "way out" of Francis if they cannot stomach his full-throttled apostasy: dump Franics, but believe Benedict XVI is still Pope. Anything, anything at all, to keep you from drawing the only sound conclusion today: The Chair of St. Peter is vacant. Sede Vacante! Ever since Benedict XVI announced his resignation on Feb. 11, 2013, the Vatican has been a continually alternating hodgepodge of drama, comedy, freak show, circus, and haunted house of horrors. Not that the Vatican II Church wasn’t already clearly a blasphemous and heretical madhouse before then, but at least it had tried to give an appearance of honor, respectability, and order. At this point, it’s a laughing stock as “Pope” Francis has maneuvered himself into what can only be described as a lame-duck session of the rest of his “papacy”, where each day that passes may bring yet another scandal, confidentiality leak, or other embarrassing development. In case you missed our initial announcement on September 26: Our popular TRADCAST podcast program is back with a new, full-length episode! As always, it is loaded with real traditional Catholicism, hard-hitting refutations of various errors, razor-sharp analysis, and a touch of humor. TRADCAST 019 covers a number of different topics, but particular attention is given to an idea that is gaining more and more popularity among Novus Ordos and Semi-Traditionalists as they reach the breaking point over the chaos “Pope” Francis is causing: the idea that Benedict XVI is the real Pope and, in any case, a stalwart defender of orthodoxy and restorer of Tradition. Segment 1: Chaos in the Novus Ordo Church; the “Benedict XVI is the real Pope” deception; disunity in the Novus Ordo Church vs. Sedevacantism; comments on The Remnant‘s “Catholic Identity Conference 2017” and analysis of “Catholics Rising” promo video; comments on the dubia and formal correction; a look at recent news headlines; why you’re not Novus Ordo anymore, reason no. 6042. Segment 2: The 1985 Ratzinger Report and the 2017 Cardinal Muller Report: nothing has changed in 30 years; rational proof for the existence of God; comments on Chris Ferrara’s “Francis Expands the Fake Magisterium”. It’s a clever ruse because… they’re both Antipopes! The fallout from “Pope Emeritus” Benedict XVI’s remarks at the funeral of “Cardinal” Joachim Meisner continues. If the initial reports were enough to makes waves, what is being reported now has the potential to turn into a tsunami. A German Novus Ordo canon lawyer has gone on record accusing Benedict XVI’s private secretary, “Abp.” Georg Gänswein, of bringing the so-called “Pope Emeritus” into position as Antipope vis-à-vis Francis. Today, July 15, the Novus Ordo Sect in Germany conducted the solemn funeral rites for “Cardinal” Joachim Meisner, who had died July 5 at the age of 83. Numerous high-ranking prelates of the Modernist Sect were gathered at the magnificent Cathedral of St. Peter in Cologne. Among them were “Cardinals” Reinhard Marx, Karl Lehmann, Gerhard Ludwig Muller, Peter Erdo, and of course Rainer Maria Woelki, the current “Archbishop” of Cologne and main celebrant of the Requiem. You’ve probably heard of him before. He is Francis’ so-called “Prefect of the Papal Household”. He is Benedict XVI’s private secretary. He is constantly around either Francis or Benedict. In other words, he’s a really important chap in Vatican City. He hails from Freiburg, Germany. His name is “Archbishop” Georg Gänswein. Like many other celebrities, Ganswein has a fan page on Facebook. This page is not maintained by him and not endorsed by him; it is simply a page about him and maintained by two of his devotees who refer to themselves by the names of “Pinky” and “Michele”. Christmas week should be fairly quiet in the Vatican, as most employees are on vacation and so Francis is more or less forced to keep silent. However, if the past is any indication, this could be the time when various newspapers and periodicals will publish previously-conducted interviews with the “Pope” or other clerics in and outside the Vatican. Such as… “Archbishop” Georg Ganswein, for example, who currently holds two important Vatican positions: He is Francis’ prefect of the anti-papal household, and he is at the same time the private secretary of Antipope Emeritus Benedict XVI. The craziness in the Novus Ordo Sect just doesn’t stop. On May 20, 2016, the Gregorian Pontifical University in Rome introduced “Fr.” Roberto Regoli’s new book, Oltre la crisi della Chiesa (“Beyond the Crisis of the Church”), a history of the “pontificate” of Benedict XVI (2005-2013). The book presentation was augmented by a talk given by the Vatican’s “Archbishop” Georg Gänswein, who is both the prefect of the “papal” household under Francis (and was formerly under Benedict XVI) as well as the private secretary of the “Pope Emeritus”, Benedict XVI. In his latest contribution, published March 2, 2014 for the Italian El Libero, Socci reveals the “serious answer” Benedict XVI’s private secretary, “Abp.” Georg Gänswein, has given to the question why Benedict sticks with the title “Pope Emeritus” (as opposed to reverting simply to “Cardinal Ratzinger”, as would have been expected) and still retains various papal insignia, such as his papal coat of arms, the continued wearing of the white cassock and zucchetto, etc.